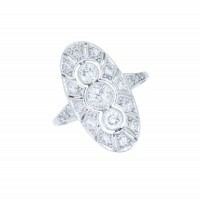 Diamond 1920's plaque ring with 3 central diamonds, platinum millegrain mount - Connard & Son Ltd.
A fine example of 1920's jewellery, this particular piece is an elongated oval shaped plaque ring, with 8 cut diamonds in their own individual settings with millegrain borders, and hand pierced between each of the 12 settings to create the gaps that you see. In the centre are 3 Victorian cut diamonds, with the centre slightly larger than the ones either side, these have a matching millegrain setting, and the hand piercing of the centre follows around the shape of the centre 3 diamonds. The shank leading up to the ring is set with 2 rose cut diamonds and 1 8 cut diamond on each side, and narrows to a fine platinum shank.